On the last Saturday of every month, except December, the streets of Fort Lauderdale’s multiple arts districts come alive for the month ArtWalk. Flagler Village encompasses FAT Village, MASS District, The Hive, & Flagler Uptown is located south of Sunrise Blvd and north of Broward Blvd, approximately 2 miles east of the Sunrise exit of I-95. This much anticipated community event brings together local artists and galleries who keep their doors open well past their normal hours, live music inside galleries, food trucks, activations & installations in the warehouses amongst other fun filled community building activities. The art walk has served as one of the best ways to bring people together in various cities over our shared passions of Art/Food/Music/Entertainment/Community, and proudly shows off Fort Lauderdale’s burgeoning arts districts. 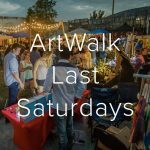 The art walk is always free to attend with free parking in #MASSdistrict behind the Sears on Federal & Sunrise, with a FREE TROLLEY service connecting the neighborhoods! If you still haven’t been, what are you waiting for?! Come #Choose954 and join us the last Saturday night of the month!